Scandiebox is a handwritten sans serif typeface created by Elena Genova and published by My Creative Land which is available in 18 styles, two scripts and over 100 layered illustrations. You can combine stylistic alternates in “Extras Fill” font to achieve the desired look. Also it has 10 seamless patterns, designed elements and social media icons. This modern calligraphic font is ideal for any kind of children project such as book, packaging, invitation, card and so on. You can see the PDF guide for the full illustrations reference. Let the fun begin! 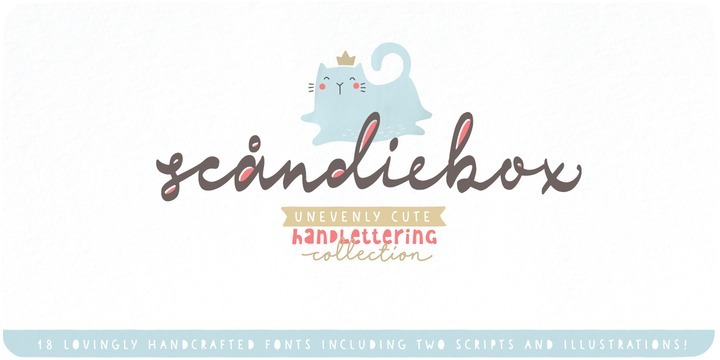 Price: starting from $25,00 for one font to $89,00 for all 18 fonts. A font description published on Wednesday, August 9th, 2017 in Elena Genova, Fonts, MyCreativeLand by Alexandra that has 2,695 views.